Tulip poplar bloom from underneath; photo by mwms1916 on Flickr (noncommercial use permitted with attribution / no derivative works). 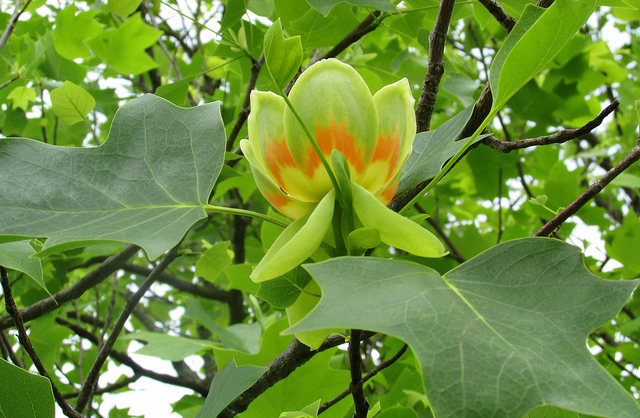 The tulip poplar is not actually a poplar tree, but a member of the magnolia family. 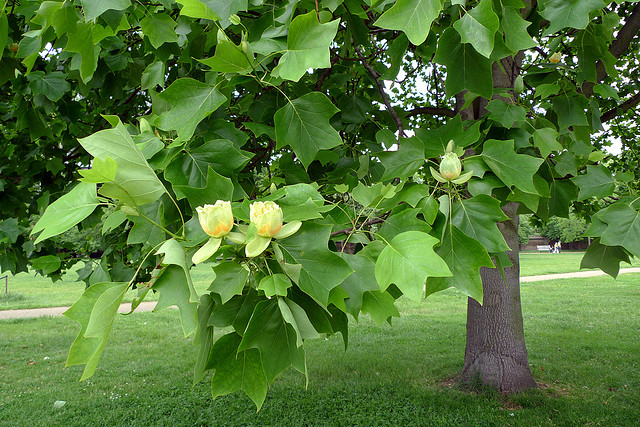 The tulip poplar leaf has a unique, distinct shape (it appears in the border of the Indiana state seal), and produces huge, bell-shaped greenish-yellow with orange flowers in the spring. Also called yellow poplar, tulip tree, or canoe tree (because Native Americans used it to make dugout canoes), tulip poplars can be found throughout the state of Indiana. Tulip poplar tree; photo by rene_beignet on Flickr (noncommercial use permitted with attribution / no derivative works).